Stromboli (Eolian Islands, Italy): The activity at the "Lighthouse of the Mediterranean" has been much more intense recently than during most of the year. Etna (Sicily, Italy): Small ash emission continue to occur sporadically from the "saddle vent" at the volcano's SE crater. Klyuchevskoy (Kamchatka): Minor activity continues at the volcano. During (rare) clear weather views, a steam plume sometimes containing some ash can be seen from the summit crater. Shiveluch (Kamchatka): KVERT reported that during 10-16 December lava-dome extrusion onto Sheveluch’s N flank was accompanied by strong fumarolic activity, dome incandescence, ash explosions, and hot avalanches. Satellite images showed a daily thermal anomaly over the dome, and ash plumes that drifted 370 km NNW during 16-20 December. A webcam recorded an explosion on 19 December with an ash plume that rose 7 km a.s.l. The Aviation Color Code remained at Orange. Bezymianny (Central Kamchatka Depression): KVERT reported strong gas-and-steam emissions at Bezymianny during 16-23 December; a gas-and-steam plume drifted about 60 km SW on 18 December. A daily thermal anomaly was detected over the volcano. The Aviation Color Code remained at Orange. Ebeko (Paramushir Island): The volcano remains site of minor activity although direct observations are sparse and only intermittent. According to the lastest Smithsonian / USGS Weekly Volcanic Activity Report 21-27 December 2016, "KVERT reported that, according to observers in Severo-Kurilsk (Paramushir Island) about 7 km E, gas-and-steam plumes containing a small amount of ash rose from Ebeko to an altitude of 1.5 km (4,900 ft) a.s.l. and drifted 8 km N and NE on 17 and 20 December. "Minor amounts of ash fell in Severo-Kurilsk during 18-22 December. Mayon (Luzon Island, Philippines): PHILVOLCS reports continued light unrest from the volcano. During the past 24 hours, 8 volcanic earthquakes were detected. Visible activity consists of moderate degassing only. Precise leveling survey and GPS results from late November 2016 indicate inflation of the edifice relative to May 2016. Other monitoring parameters show no significant variations. Bulusan (Luzon Island, Philippines): A moderately strong phreatic explosion occurred this afternoon at the volcano at 14:40 local time, lasted approx. 16 minutes and produced an ash plume that rose 2000 m.
PHILVOLCS reported increased seismic activity during 22-25 Dec preceded the event which seems to be the result of destabilization of the shallow hydrothermal system. GPS data also indicate slight inflation of the volcanic edifice, indicating internal pressurization (likely caused by an underlying magma body). Bagana (Bougainville Island, Papua New Guinea): The volcano's activity has decreased, judging from the decrease in heat emission, although minor ash emissions continue to be frequently observed on satellite imagery. Langila (New Britain, Papua New Guinea): A new eruption is occurring at the volcano. Satellite data which show a strong thermal anomaly suggest lava extrusion probably on the northern summit area. Sinabung (Sumatra, Indonesia): The volcano's activity continues with no significant changes. Occasional incandescent rockfalls, small pyroclastic flows and vertical explosions, with ash plumes rising up to 3-4 km, accompany the slow growth of a viscous lava dome in the summit crater. 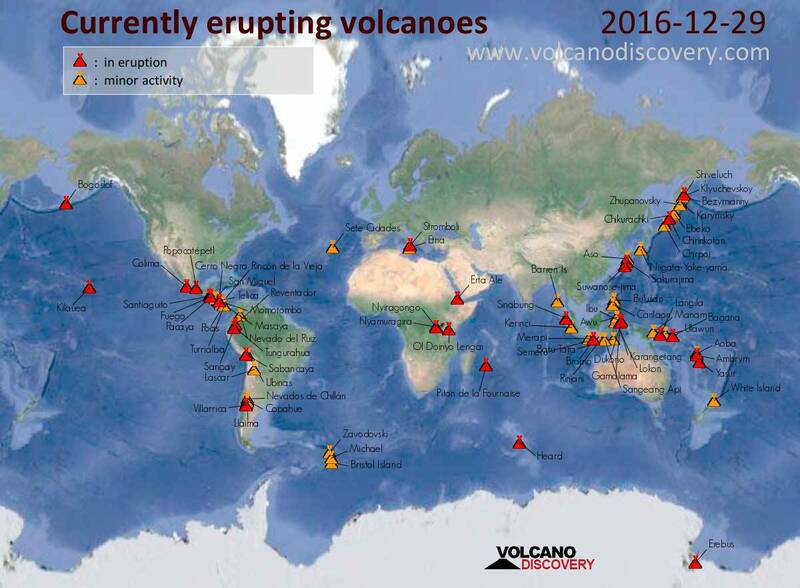 Volcanic Ash Advisory Center Darwin (VAAC) issued the following report: GROUND REPORT OF ERUPTION TO FL120 AT 29/0233Z MOV TO SW.
Dukono (Halmahera): The activity from the volcano continues with little changes. Near continuous ash venting and strombolian explosions inside the summit crater produce ash plumes that reach 7-8,000 ft (2-2.4 km) altitude and drift into various directions and are being spotted by VAAC Darwin almost every day. Bogoslof (United States, Aleutian Islands): The volcano remains in a state of elevated unrest, the Alaska Volcano Observatory (AVO) reported. Colima (Western Mexico): The frequency of explosions has decreased a bit, but overall, the volcano's activity has not changed much. Turrialba (Costa Rica): Intermittent small ash emissions continue to occur from the volcano. Not all of them are visible (due to weather), but can be inferred from seismic recordings and sometimes light ash falls in nearby downwind areas. The most recent such episode was reported yesterday night at 22:12 local time. Sabancaya (Peru): The activity at the volcano remains intense and has not changed much over the past weeks. Frequent explosions (50-60 per day) produce ash plumes that rise up to 3-4000 m and drift into various directions before dissipating after reaching 20-50 km. Copahue (Chile/Argentina): The volcano continues to have some mild activity in the form of strong degassing and minor ash venting from likely phreatic activity. Nevados de Chillán (Central Chile): After several weeks of apparent calm, a new explosion occurred yesterday morning. Erta Ale (Danakil depression, Ethiopia): Activity remains elevated at the volcano in the Danakil. The latest available information show simultaneous effusive activity from both the north and the south crater - the latter, which contained the famous lava lake has been overflowing and building a new lava shield that started to partially fill the summit caldera. It seems that lava flows have started to overflow even outside the caldera through the low part of the rim on the NE side (judging from satellite data). Our next Erta Ale Volcano Special tour is soon (on 14 Jan) leaving for the volcano to stay 4 days and nights. Participants will hopefully be able to provide fresh information from the field.